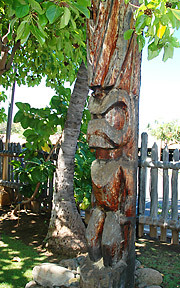 Most of the west side Tiki's are located within the luaus or shopping centers. 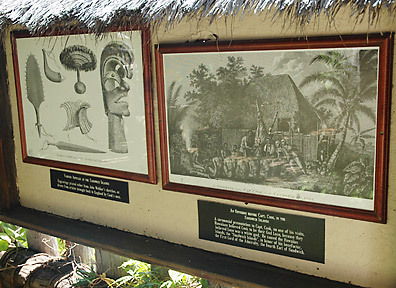 The photos above and to the left were taken at the Old Lahaina Luau. I highly recommend this luau, but it can get booked full weeks in advance. So be sure to book online before leaving on your trip to Maui. 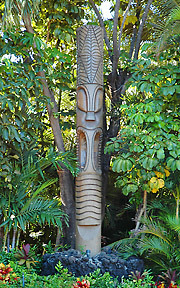 Probably the largest Tiki on Maui is located at the Kaanapali Beach Hotel. This tiki stands next to their Tiki Bar out in the pool area. Yes they even will serve you a drink out of a cheap Accutruments tiki mug. I'd recommend finding a beach access parking spot and walking the beach walk to the Kaanapali Beach Hotel. Walk past the pool towards the lobby to find the Tiki Bar and this HUGE Tiki. 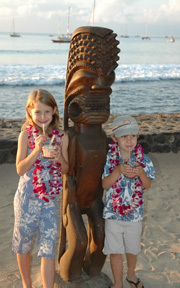 Another resort with great Tikis is the Westin Kaanapali, located two miles north of the Kaanapali Beach Hotel. Because of its location on a popular stretch of North Beach, it's probably easiest to take advantage of the cheap self-parking on-site. After viewing the Tikis, it's worth it to take a stroll around the resort as some of the most beautiful gardens in Kaanapali are found here. If you don't mind taking a few hours out of your day, you can also take a timeshare tour here, which allows you to see the resort and get some free perks as well. If you want to stay at this resort, I recommend visiting SellMyTimeshareNow.com to find affordable Westin Kaanapali timeshare rentals by-owner, rather than going directly through the resort. The Tiki Mug to the left was designed after the two large Tiki's in the Westin's North lobby. You may still be able to pick one up at the Pulehu restaurant or at the lobby gift shop. It measures over 9 inches tall and would make a great addition to your Tiki Mug collection. The Royal Lahaina Luau features Fire dancers, and is less expensive than the Old Lahaina Luau. 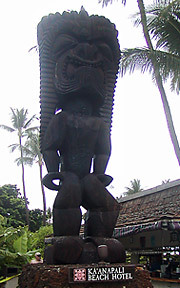 This is the Huge Tiki near the Luau entrance. 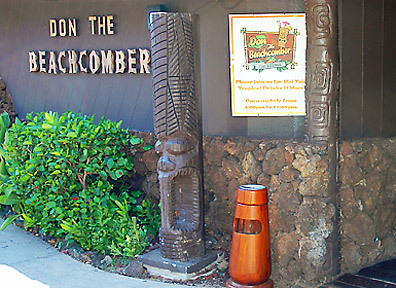 Right next to the luau is the newly re-opened Don The Beachcomber Restaurant. Honestly I haven't ventured into the restaurant, but it appears to have a fun tiki theme and serves Hawaiian cocktails. Hale Kahiko is located in the parking lot of the Lahaina Center, at Papalaua Street and Front Street in Lahaina. 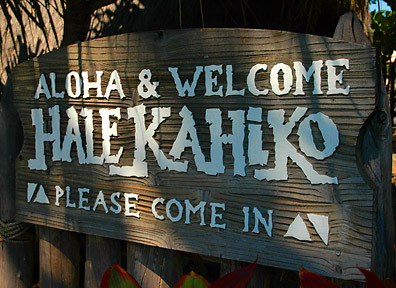 (Behaind Hard Rock Cafe) Hale Kahiko is a free exhibit of Hawaiian huts and Tiki's. 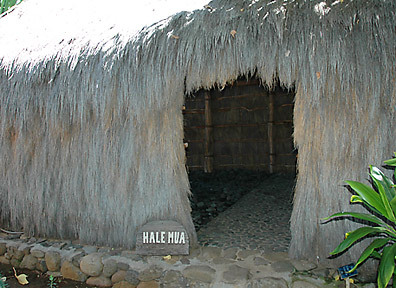 Hale Kahiko offers a wealth of information and is definately worth a stop. Besides you know you will be spending time shopping on Front Street anyway. At the other end of Front Street from Hale Kahiko is the Banyan Tree Park. 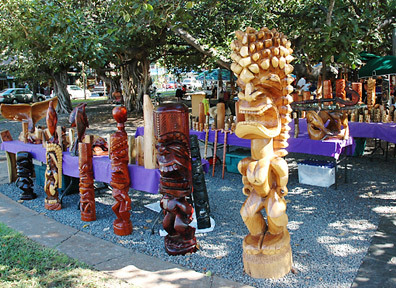 Under the banyan tree is a variety of crafts people selling their art. 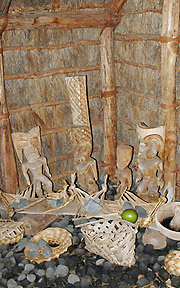 Generally there is at least one Tiki Carver. 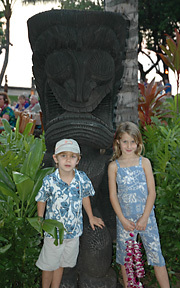 On this day he had some overpriced but very impressive Tikis. The big one on the right was $3,000 and the dark colored one next to it was a more reasonable $900. Those Large Tikis don't fit in suitcases very well, so he also offers a variety of smaller sizes. Be sure to cick on the images for larger versions. 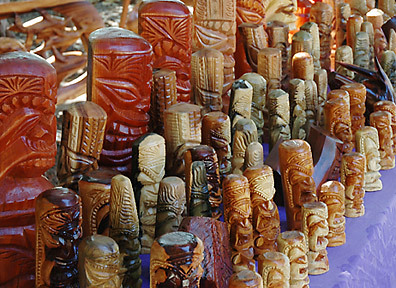 Along Front Street, Lahaina, you'll never know what you'll see. 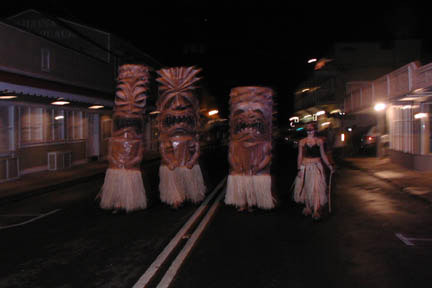 If you are lucky enough to be in Lahaina for Halloween, don't miss Front Street and all the costumes. You are bound to see a Tiki or two cruisng by.